During the weekend, the Douglas County Sentinel ran an article looking back on the brief and colorful history – and dissolution – of the city of Lithia Springs. I was, at that time, a cub reporter for the local daily, and spent many an hour in a chair in what passed for the chambers of the Lithia Springs City Council, recording for our readers a city’s death throes. It left a lasting impression on me of a resident’s relationship with a municipal government. But, more than that, it left me with some wonderfully idiotic stories. Picture, if you will, the great centers of government now established throughout Douglas County. The Douglas County Courthouse, constructed in the 1990s, features a domed rotunda complete with the inspiring words of the preamble to the Constitution spiraling down it. In Douglasville, the city’s business is conducted in what was, when I was young, O’Neal’s, which is where my Granny bought me my husky Levis for school. Prior to that, it was the Alpha – a movie theater still recalled by many long-time residents for its “Coloreds Only” balcony. Now, the old space on a corner of downtown’s historic area looks out over a beautifully fashioned plaza and, soon, a new downtown convention center. The Douglas County Courthouse -- a fine, and still fairly new, home for government operations. In Lithia Springs, they had Ty Hall. It wasn't like this. In Lithia Springs, city bid’ness was conducted around back of an old hardware store. A gravel parking lot, a flagpole dedicated by the Sons of Confederate Veterans, a dumpster and an old SUV with the city seal on the door and “CODE ENFORCEMENT” painted on the fender stood in place of the statues and memorials many have come to expect before government buildings. The story of the city, however, was sadly detailed by the blocks upon which the city’s lone government vehicle – the SUV – had been lovingly placed. To conduct formal city business inside, such as council meetings and court, the desks of the city’s handful of employees – a code enforcement officer, a secretary, and someone who probably handled filing or something like that – were pushed aside and folding tables were set up. These were the city council’s dais. By the time I began attending the city council meetings, then-Mayor Brian Hilton had resigned (surprisingly, not under allegations of impropriety; rather, he was seeking to advance his political career and left to run for a seat in the General Assembly). That left Mayor Pro Tem Johnny Poole to assume the gavel and the formal obligations of the mayor. A mayor pro tem is sort of a vice president; a member of the legislature (the city council) who fills-in for the mayor if he or she cannot attend a meeting and serves as mayor should he or she be incapacitated, expelled from office or resign. However, the mayor pro tem does not become mayor – rather, he or she serves as mayor until a new mayor is elected. Mayor Pro Tem Poole, however, saw it differently; he was doing the job of the mayor, and he was serving as mayor pro tem. So, with the powers of mayor, he began to pay himself the salary of both. Just as one cannot be in two places at once, however, one also cannot hold – and be reimbursed for – holding two elected positions in city government. Adding to the mix was that Mayor Pro Tem Poole often appeared, I don’t want to say inebriated, but a bit, er, staggered at city council meetings. But then, perhaps overseeing the business of running the great municipality of Lithia Springs would leave anyone glossy-eyed. Since the whole city facility was essentially the city council chamber, and since the weather outside was inclement that evening, the council was kind enough to adjourn themselves to the small, windowless office of the mayor rather than forcing all in attendance out into the muddy parking lot to mill around the city SUV on blocks. By then, mind you, the city council’s antics had begun to draw quite a crowd of spectators. At the close of the executive session, said councilman returned to his seat, scrawled a letter of resignation on the napkin under his cup, handed it to Mayor Pro Tem Poole, and walked out into the night, never to be seen at a city council meeting again. The mayor pro tem struggled to focus on the councilman’s handwriting – probably because of the poor lighting, lousy penmanship and farsightedness as opposed to being under the influence of anything in particular – and announced that it appeared the councilman had resigned, effective immediately. Finally, the city died. Residents elected a mayor, in the person of Glenda James, who had resolved herself to be the bullet that brought down the leviathan of Lithia Springs. Mayor James, who had been a vocal participant in the city council meetings from the peanut gallery and who, I’m sure, had been escorted out into the gravel lot at least once and most likely more often by the sheriff’s deputy who began to be required to police the raucous meetings (the city not having a police force of its own, thank God) began the work of dissolving the city. Residents sued, alleging the city was not providing enough services to justify its existence. 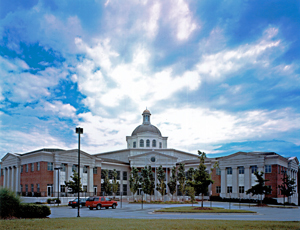 In Georgia, an incorporated municipality (as opposed to an unincorporated part of a county) is required to provide a certain number of services beyond what the county provides. Often, this means something along the lines of trash collection, perhaps utility services (Austell operates a natural gas company) or its own fire department. Lithia Springs had a couple of guys with a bucket of gravel and a shovel. They were the Roads Department. Everything else – EMS, police, fire rescue, etc. – they contracted with the county to provide. Douglas County Sheriff’s Deputies patrolled the streets and answered calls. Douglas County Fire Rescue personnel provided fire protection and ambulance services. Various large projects were contracted to the county, often at a friendly discount. Outside of the pure entertainment value of the city council, there wasn’t much reason for Lithia Springs to exist, and a Douglas County Superior Court judge agreed. The city’s only recourse was to provide more services, which would require more revenue. More revenue would require leveraging a city property tax, the absence of which was one reason many in the city had voted for incorporation. Suffice to say, with the threat of a city-mandated property tax looming, residents voted overwhelmingly to dissolve the city. The county’s local delegation to the General Assembly – the representatives and senators whose districts included some portion of the county – introduced legislation to dissolve the city (lacking sovereignty, cities and counties exist at the pleasure of the state, and only the state can create or destroy a city or county). The legislation carried pretty much unanimously, as most local legislation does (or did back in the day, anyway) and the city ceased to be. The county came to collect what remained of the city’s assets. The commission chairman and the county commissioner who represented the eastern part of the county watched as crews loaded filing cabinets into the back of box trucks. They even towed away the old code enforcement SUV. The doors to Ty Hall were locked, and the era (or error) of Lithia Springs came to an end. Last time I drove past, the hardware store was gone, and a computer repair shop was in its place. The times, they are a’changing. But still, in downtown Lithia Springs, stands the ornate clock in a green patch of grass between Highway 78 and the railroad tracks – a reminder of the city that was and, with incorporation run amuck in metro Atlanta – might one day be again. Just saw your story on Lithia Springs of Jan 2012, however I noticed you did not name the council person that walked off into the night. His name was, or is Ernest Thomas who now lives in Clinton Twp. Mich. He as you know was the first African American to be elected to that council. I just happen to be looking for anything on Brian Hilton so that I could get in touch with him and saw your article. It brought back memories. Good to hear from you, Councilman Thomas! Last I heard, Mayor Hilton was still practicing law in Douglasville. He advised me on some matters several years ago involving an easement the local water and sewer authority was working to put across some land that was in the family. I hope this blog from yesteryear found you well.